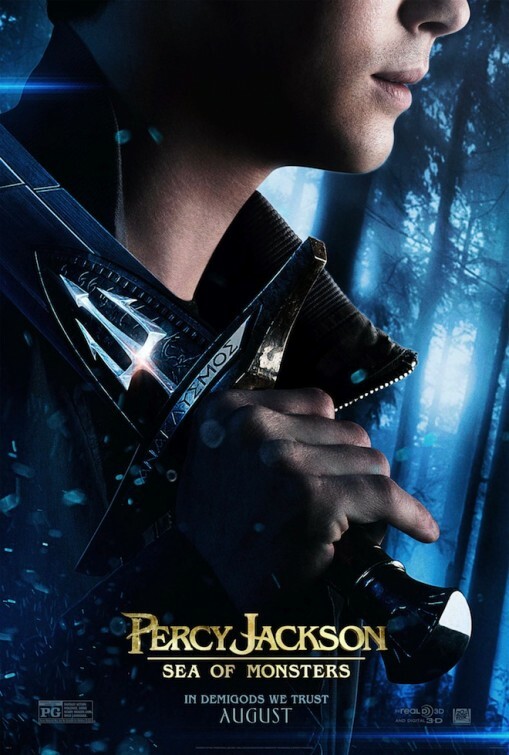 Percy Jackson and the Lightning Thief came out in 2010, and it reminded me a lot of the Harry Potter movies, except more mythical and less wands, and I liked it. Sea of Monsters is the second movie (and also book) in the series, and although it's not quite as good as its predecessor, it's still a fun film to watch. Percy (Logan Lerman) and his friends start off the movie at Camp Half-Blood, a camp for those who are sons and daughters of the gods (products of the gods and humans). They are protected by a force field surrounding the camp, until one day an angry, electronic-type bull breaks in to the camp and causes havoc. The campers soon deduce that the force field is no longer working, and the reason for this is that the magical tree that emitted it - who used to be a person, but that's a whole other story - is dying. The only thing that will cure the tree is the Golden Fleece, which is located in the Sea of Monsters, a place that humans call the Bermuda Triangle. Although Percy is not the "warrior" chosen to go on this mission to find the Fleece - that would be Clarisse (Leven Rambin), a fellow camper who is an awful, snotty person - he knows that he must go anyway to try and find it, and he and his friends sneak away from camp and embark on their own self-imposed mission to get it. There was an odd mix of veterans and newbies in the cast, but they seemed to work well together. I enjoyed Lerman in the first Percy movie and also the recent Perks of Being a Wallflower, and I didn't know that Stanley Tucci (Jack the Giant Slayer), Jake Abel (The Host) and Nathan Fillion (Waitress) were in the film until I saw them on-screen, even though Abel was in the first Percy movie.. It's also always nice to see Brandon T. Jackson on the silver screen, since he's a Michigan native and also a WBHS '02 alum - I'm an '05 alum, so we overlapped by one year. Yes, see this film, and see it in 3D, as it was fantastic in some of the action scenes. My chief complaint about this movie, though, is that even though it has a relatively short runtime, parts of it were very slow, and so the movie felt longer than it actually was. It does have my lowest Yes rating (3 out of 5 stars) but it would be good to see at a matinee. I haven't read the Percy books but I did hear some book fans complain that the movie was completely different from the Sea of Monsters book, so do keep that in mind as well if you are big fan of the novels. I found the film to be a fun adventure film - surely there are better action options out there right now, like 2 Guns, but you won't find one geared as much towards kids (or with a PG rating) as Percy is. Percy Jackson: Sea of Monsters is in theaters today, August 7th, and is rated PG with a runtime of 106 minutes. 3 stars out of 5.